Artist signed and dated in the lower left corner: J. Not titled - Tropical Landscape and Seascape. Image Size: approximately 8 5/8"h x 11 5/8"w. Framed Size: 13.75"h x 16 5/8"w.
Condition: The painting is in very good condition. There are a few scratches in the painting along the lower/bottom border of the frame. The frame has a few scratches. The back of the canvas has a dark spot. There appears to be writing on the back of the canvas under the right side of the frame. Castro was from Nueva Ecijano and a protege of Fabian DE la Rosa, who was then the director of the School of Fine Arts of the University of Philippines. Castro often went to Baliuag, Bulacan to paint its scenery, and later settled and worked there. Castro is known for landscapes and still lifes, his still lifes have often been likened to the works of the Flemish baroque school. 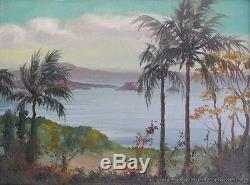 The item "Vintage Original Framed Signed Castro Listed Oil Painting Tropical Seascape" is in sale since Tuesday, August 6, 2013. This item is in the category "Art\Paintings". The seller is "ad" and is located in ca. This item can be shipped to United States.